Borussia Dortmund have a strong chance of reaching the last 16 of the UEFA Europa League after Michy Batshuayi’s brace gave them a thrilling win over Italian side Atalanta in Thursday’s first leg. Skipper Marco Reus could have given Dortmund the perfect start inside six minutes, but he fired wide when played in by Andre Schürrle. With an extra man in midfield, however, the visitors looked assured early on, and Bryan Cristante was denied by a superb Sokratis tackle. Atalanta defender Mattia Caldara miscued a close-range header from the corner that followed, but from there Dortmund took control. Schürrle had a shot deflected inches wide, Batshauyi tested the keeper and Christian Pulisic almost connected with a Reus cutback. The pressure finally paid on the half hour when Schürrle – moments after getting another shot on target – beautifully controlled a Lukasz Piszczek ball before sliding home. 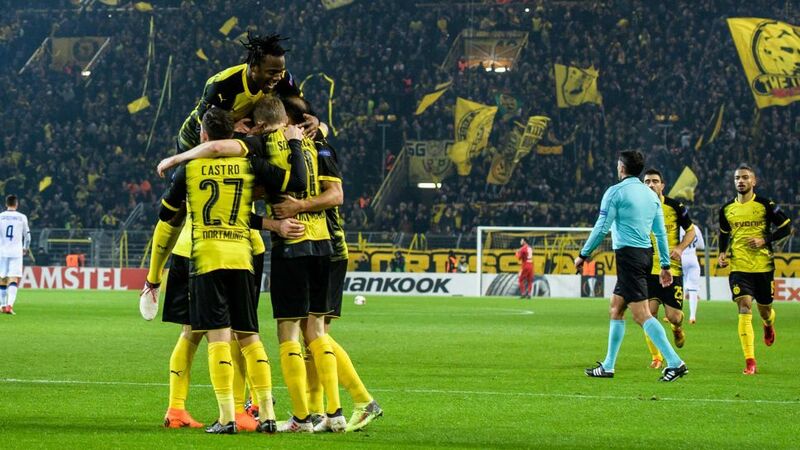 Dortmund’s good work was undone swiftly in the second half though, as Josip Ilicic struck twice in five minutes. First he crept in at the back post to sweep home from the edge of the six-yard box, and then the Slovenian slammed home the rebound after Roman Bürki could only parry Cristante’s angled shot. The home side sent on Mario Götze in response and, after Schürrle won the ball, the substitute created an equaliser midway through the half. The inspirational Batshuayi smashed home from the edge of the box to level and there was more to come. In injury-time Götze found the on-loan striker inside the box, and he capped another excellent display by swivelling to score his second of the game and his fifth in three matches as a Dortmund player. Watch: Borussia Dortmund's fresh attack with Marco Reus! Reus’ last game before the Hamburg win on Saturday was Dortmund’s DFB Cup final win over Eintracht Frankfurt in May 2017.Batshuayi has scored five times for BVB since joining the club as Pierre-Emerick Aubameyang's replacement at the end of January.Since Stöger replaced Peter Bosz as coach, Die Schwarzgelben have only lost once in 11 games in all competitions.Dortmund reached the quarter-finals in 2015/16, losing 5-4 on aggregate to Jürgen Klopp’s Liverpool.This was the first competitive meeting between the sides, though Atalanta edged Dortmund 1-0 in a pre-season friendly in August.Dortmund have faced Italian opposition 31 times, winning 12 and drawing four. Unused Subs: Weidenfeller, Beste, Sahin, Zagadou.